How is life once you have been sectioned? And how is it for those who are close to that person? These are the questions explored by Paper Creatures in Section 2. Cam (Nathan Coenen) has been sectioned for 28 days. Today he should go back home. 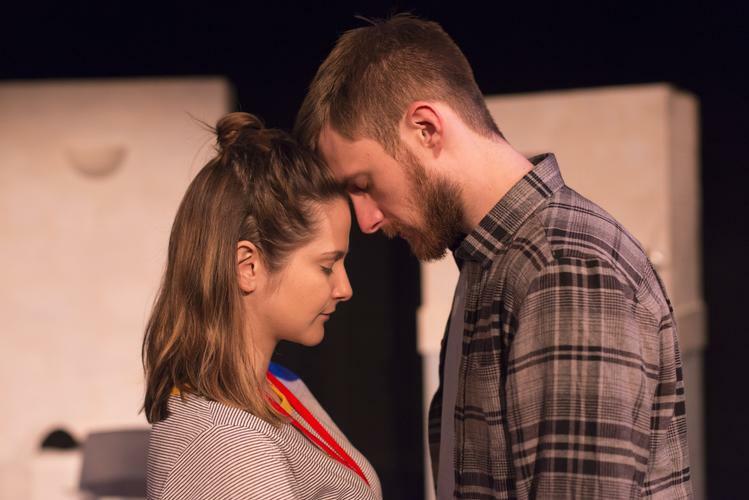 His friend – even if they haven’t seen each other for 5 years - Pete (Jon Tozzi) and his girlfriend Kay (Alexandra de Silva) are in the waiting room, and can’t wait to hear what the nurse Rachel (Esme’ Patey-Ford) will have to say about Cam’s recovery. It takes courage to put on a stage a story about mental health and sectioning. But it is an excellent idea, developed thanks also to MindCharity that helped the writers to make it realistic. The actors are all very talented. Esme’ is a human and well balanced key worker, Jon shows well the hesitation on how to deal with an old friend who does not even recognize him, and Nathan is mesmerizing in his performance. The character of Kay is too self absorbed to be liked and her philippics look out of context, even if it is understandable some frustration for a recovery that seems to be slower than expected. Also, the background of Cam and the current diagnosis are not well explained. Mental health is a difficult subject for many people, and most of the difficulty is because – many times – we don’t know why it happens. And it is painful to deal with something we don’t know the reason. But the beautiful end of the play shows that, no matter why, the important thing is to be strongly together to show as much support as we can. A powerful show with strong performances about an important topic that has not been addressed enough. You can check our interview with Alexandra and Esme’ here. Section 2 is at The Bunker Theatre from 12 June-6 July 2018 (Tuesdays and Fridays @ 8.30pm).